Cleveland – My personal favorite, A.I. and Lebron could play together in a way that Melo and A.I. never will. 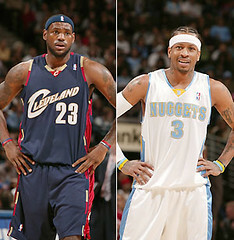 Lebron is a much better 3pt shooter and passer than Melo, opening up a lot more scoring opportunities for A.I. (and the rest of the Cavs) that simply don’t exist in Denver. Additionally, if Cleveland had A.I., their offense wouldn’t grind to a halt when Lebron went to the bench. Finally, A.I.’s defensive liabilities won’t be as significant in Cleveland as they are in Denver. Denver would gladly take Delonte West back as their PG of the future, and Cleveland has some attractive expiring contracts. Cleveland throws in a late first round pick and we’ve got enough to make a deal. When I read the rumors about Reggie Evans being traded to the Magic, my heart jumped a little. JJ Redick? The shooter the Nuggets desperately need? Or maybe Hedo Turkoglu, a good defender with 3pt range that could cause matchup problems.